HomeNewsBefore it Breaks win Ned Kelly Award for best crime novel! Before it Breaks win Ned Kelly Award for best crime novel! 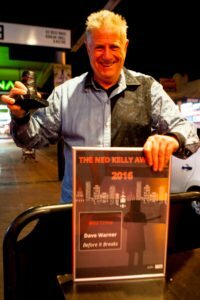 Winning the Ned for best novel for Before it Breaks represents a return to the fold for Dave Warner. The last of his six previous crime novels, eXXXpresso, appeared in 2000 since when the writer and musician has been working for the big and small screens. 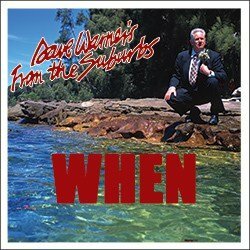 But for one reason or another the television work dried up and Warner could return to crime fiction and making music – his band the Suburbs is recording its first album in 35 years – the two thing he loves most. He said going back to fiction was as if he’d been playing badminton and someone had called him in to play tennis on a grass court. 2 Comments on Before it Breaks win Ned Kelly Award for best crime novel! 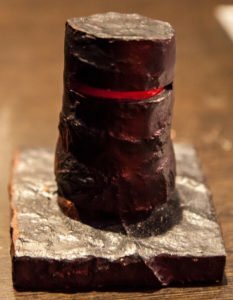 well congratulations on winning the Ned kelly award, I really hope that a movie is made of it as it does have, movie, movie, movie written (sic) all over it. also looking forward to new suburbs cd, but really ‘good on you ‘ for winning the award – ha! – did notice the dedication to Nicole-‘shelter from the storm’ not only apt for the title but the unseen support to the man behind the word processor – right?